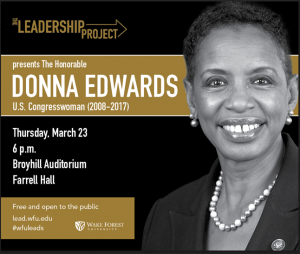 Donna F. Edwards was an English major at Wake Forest, and will be speaking in President Hatch’s Leadership Project series. This event is free and open to the public. The event will be in Broyhill Auditorium in Farrell Hall on Thursday, March 23, at 6 p.m.